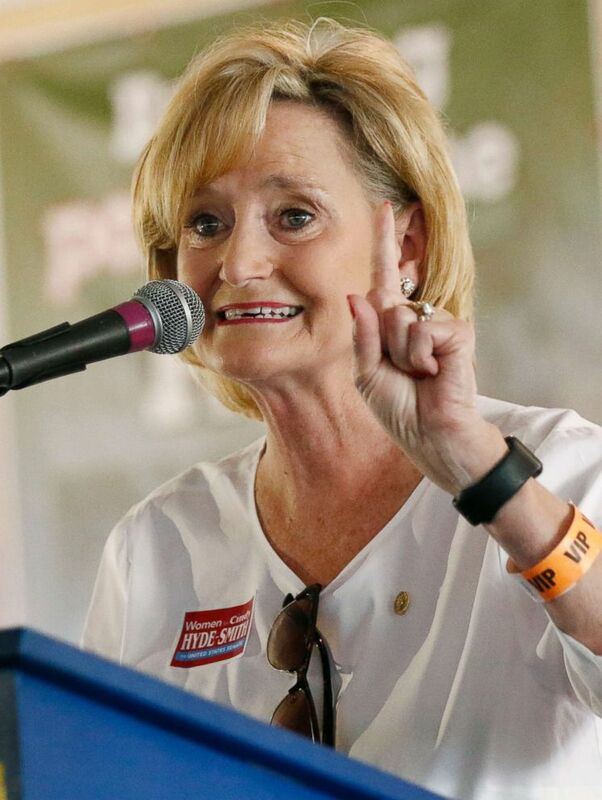 In a race that was supposed to be a Republican rout in the Deep South, GOP incumbent Cindy Hyde-Smith’s campaign seems to be stumbling after a series of public statements on video and a collection of public photos from 2014 were released, calling into question her views on race and voting rights. In the first and only debate in the race, Hyde-Smith sought to address those concerns — reading an apology from her notes to “anyone offended by my comments” — a vague reference to the uproar over a racially tinged joke about “public hangings” that pushed the race into the national spotlight and unexpectedly shifted the tenor of the race in favor of Democratic candidate Mike Espy, with national party leaders, including 2020 potential contenders flocking to Mississippi to campaign for him. Sen. Cindy Hyde-Smith speaks at the Neshoba County Fair, Aug. 2, 2018, in Philadelphia, Miss. Hours before the debate on Tuesday, photos surfaced on Facebook showing Hyde-Smith donning a Confederate soldier hat, with the caption “Mississippi history at its best.” The existence of the photos was first reported by Politico. Hyde-Smith’s campaign declined to comment to ABC News on the photos. “Then they remind me, that there’s a lot of liberal folks in those other schools who that maybe we don’t want to vote. Maybe we want to make it just a little more difficult. And I think that’s a great idea,” she said to a group of supporters in Starkville on Nov. 3. Despite evoking language reminiscent of lynchings that scar Mississippi’s history and also appearing to support voter disenfranchisement — another battle wound for African-Americans in the south — Hyde-Smith did not apologize for either comment before Tuesday’s debate. The top Democratic super PAC for Senate Democrats, the Senate Majority PAC, invested $500,000 to flood the states’ airwaves. The ad buy began on Nov. 16. A first ad targeted Hyde-Smith on health care, suggesting she is in the pocket of health insurance companies and will increase health care premiums — without mentioning the Affordable Care Act. Using his moderate appeal to attract white voters, Espy is running as an “independent” Democrat. “Even though I’m a Democrat, I’m an independent — a small ‘I’ — Democrat, meaning that I’m a Mississippian first,” Espy told ABC News in an interview last month. 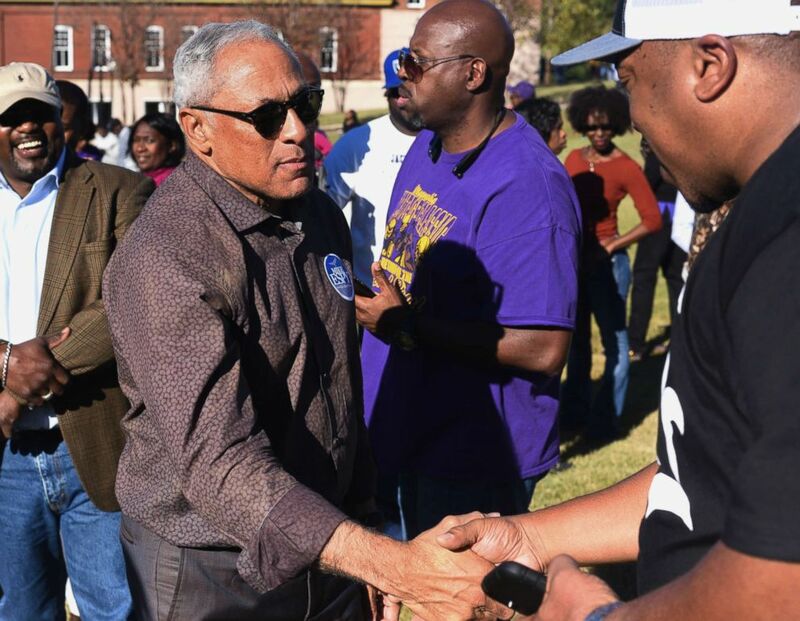 Mike Espy, who is seeking to unseat appointed Sen. Cindy Hyde-Smith, R-Miss., shakes hands with a supporter during a rally in Vicksburg, Miss., Nov. 16, 2018. But some Republicans are intensifying their efforts to secure Hyde-Smith’s hold on her seat amid growing concerns over her candidacy. On Tuesday, Trump defended Hyde-Smith and said it was a “shame” that she is facing criticism over a comment “said in jest” when asked about her candidacy on the White House North Lawn Tuesday. 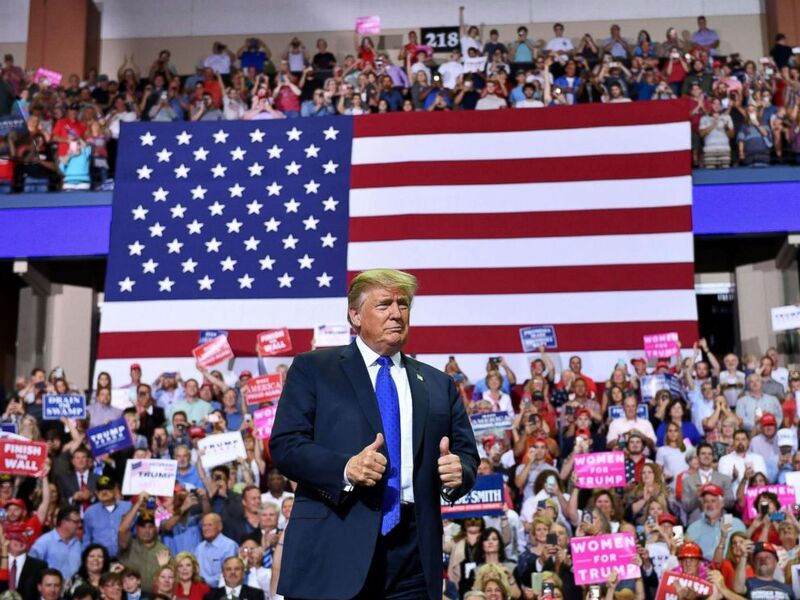 President Donald Trump arrives at a “Make America Great Again” rally at Landers Center in Southaven, Mississippi, Oct. 2, 2018. A new digital ad from Hyde-Smith’s campaign, released Friday, touts an alleged connection between Espy and the African despot who refused to give up power in the Ivory Coast and is now on trial for crimes against humanity in International Criminal Court. The statement and the ad are based on a Fox News report, released Thursday, that published a U.S. Department of Justice Foreign Agents Registration Act document that questions if Espy lied about receiving payments as part of a lobbying contract with the Ivory Coast’s former president. Hyde-Smith reported 17 new contributions totaling $65,700, including $5,000 from Google’s PAC, on Tuesday, shortly after the controversy erupted, according to Open Secrets. Google’s contribution is the PAC’s first to Hyde-Smith’s campaign, but the company told Open Secrets it was made far before her controversial remark.